It’s our brand new Petey Penguin Collection! 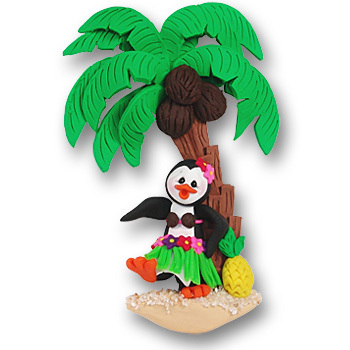 Polly has left her icy home and has hit the beach! She is all dressed up with her little hula skirt and coconut top! As is the case with all of our ornaments, this one in particular is extremely detailed. From the palm tree and coconuts to the real sea shells and grains of sand. A great personalized gift for any age. Polly is easily personalized but looks great without. Handmade from polymer clay and designed by Debi Allison. Polly comes complete with a hook and satin ribbon for hanging. Look out Petey! Polly has her eye on you!